When creating a workflow that involves multi-checkboxes, I love that we have the option to append instead of overwrite our existing selections. However, the append option isn't available everywhere. When using the "Set contact property value" button below, the append option is available. 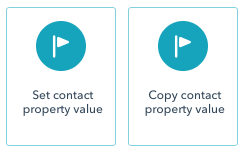 However, if I choose the "Copy contact property value" button, there's no append option. This means I have to resort to elaborate workarounds involving multiple if-then branches just so I can ensure that none of my data is overwritten. Since the append logic is already built out for the "Set" button , it shouldn't take that much dev time/effort to add it to the "Copy" button too, right? I know this would be very useful and a huge time saver. Thanks! I just realized this is also an issue when attempting to copy a property value from a contact record to a company record. Maybe I'm the first person to ever run into this, so here's why this would be so useful. Let's say I have a contact property that tracks which products a contact is interested in. (Spoiler alert: I do.) It would be very valuable to aggregate this info for all employees at a company. So for example, if I know that one employee at a company is interested in products A and B while another employee is interested in products C and D, I'd like to copy all four products to the corresponding company property. That way my sales team knows the full picture when they walk into any given situation. Q: To SET, or not to SET ... that is the question. We hear you @rstevens. Makes sense, but COPY and SET are two very different functions. Maybe suggest your idea in the HubSpot Ideas section. In the meantime, here's a scalable solution we can implement now using the existing (SET) framework -- i.e., native HubSpot append functionality. Activate your workflows and grab a cup of coffee while the DB updates. Done! Q: Add "Append to current value(s)" option when copying to a multi-checkbox property. Short A: The way your question is framed around 'copying' seems to discount native HubSpot workflow append functionality when using SET. Does this KB article entitled, "How do I use a HubSpot workflow to add or append a value to a property instead of overwriting it?" solve your issue? Please include @MFrankJohnson if you'd like me to respond. Like I mentioned above, since the append logic already exists, I'm crossing my fingers that it would be pretty quick and easy for the dev team to just clone the feature from one button to the other. @MFrankJohnson That does make sense, thanks. A Rube Goldberg-esque solution like this definitely appeals to my geeky sensibilities… but man, I wish I could just do it in one step. I'm new to the HubSpot Community boards and didn't realize that there's a separate Ideas section. I'll definitely try out your idea, but I'll also see if I can get some traction over there. Thanks again! Rube Goldberg-esque for sure. That's HubSpot. It's also helpful if you mark this request as 'solved' so the rest of the community may see it as a resource (for future reference). Good luck on your projects @rstevens. This topic is solved-ish, so marking it as such. Thanks to @MFrankJohnson for the workaround. Started a new topic here in the HubSpot Ideas forum to hopefully get a more one-click approach implemented. I've run into this issue myself and totally agree with you, it seems like an easy addition. If its for the purpose of list segmentation or workflow enrollment, you could try a different approach and use the contact property 'has ever been equal to/contained' option, as another workaround approach? It may mean switching your general approach slightly, but it really depends how you use the properties in question. To show those that used to have the value, adding an OR to also capture those that currently have it. From each contact record you can see a fields history, so you can see historical values there too. Not the ideal solution, but might simplify some of your woes until the functionality becomes available. I've upvoted and commented on your post in the ideas section.